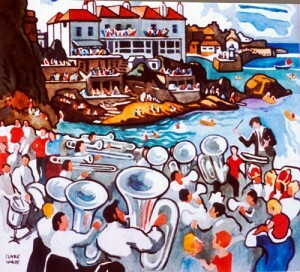 Renowned St Ives artist Clare White was born in Sidmouth, Devon in 1903. Her wealthy mother died when she was eight, bequeathing her two defining gifts – a small but comfortable income for life and a close relationship with her keen amateur artist father Arthur White. Clare received the education of an Edwardian young lady. She attended boarding school at Tavistock in Devon; studied the History of Art at finishing school in Lausanne, Switzerland; then enrolled at the Torquay School of Art (1920 -23). She became one of the first female students allowed to paint life models and, as a student, won a bronze medal at the Royal Drawing Society Show in London – for a tea cosy design influenced by Japanese art. White’s talent was apparent from these early years and she exhibited widely between 1920 and 1950 at the Royal Academy and Paris Salon as well as with the Royal Pastel Society, the Royal Society of British Artists; the Royal Scottish Society of Painters in Watercolours; the Society of Women Artists and at the Goupil Gallery in London. Her watercolours were prominently exhibited at the Royal Institute of Painters in Watercolours (RI) in Piccadilly. In 1935, she was commissioned to paint the scenery for a lavish production at Paignton’s ‘Palace Theatre’ in honour of King George V’s silver jubilee. A young woman of independent spirit and equally independent means, White’s life became compelled by two impulses, to paint and to travel. From the mid-1920s, Clare toured Europe and the world. She lived for a while in the Paris art community of Montmarte and also stayed in the small, coastal, artistic community of Pont Aven in Brittany – made famous by Emile Bernard, Paul Gauguin and the influential Nabis Group of painters. She travelled alone to Venice, Switzerland, Sicily, Rome, Turkey, Egypt, Iran, Bosnia and to Barbados – where her sister worked as a governess. She spoke five languages fluently and during World War Two, chose to live in Paris and study an economics degree to ‘try to find out how to prevent wars.’ Indomitable and intelligent, everywhere she went, she took her watercolours and her paper. St Ives – Right Place, Wrong Time? In 1949, Clare White and her father moved to St Ives and she became an active member of the most vibrant art colony in the UK. Her contemporaries included Barbara Hepworth, Peter Lanyon, Bernard Leach and Royal portraitist Malcolm Haylett and his artist wife Jean. In 1954, Clare became the first female President of the St Ives Arts Club where she designed posters, directed plays, painted stunning scenery and gave illustrated talks on her many travels. She exhibited with the St Ives Society of Artists, gave language lessons and wrote as an art critic for the St Ives Times and Echo. She did not, however, get much involved with the war going on between modernist and marine academic art movements in the art colony during the mid-20th century. She exhibited with the traditionalists but her unique style did not really fit in to either camp. Then, when the groundbreaking abstract modernists became the focus of international critical acclaim her own work became one of the many examples which fell in the shadow of this colossal movement in British art. In any case, watercolours were routinely dismissed as ‘painting for ladies’ by the art establishment of the day. White made no effort to seek commissions for book illustration or travel posters, which were so popular at this time. She simply carried on painting. With her small personal income and loyal friends, she didn’t care about lack of recognition or commercial gain – this is one of the key reasons sited for her work being so long overlooked in Cornish art history. White’s colourful, characterful style was unique. She remained dedicated to watercolour all her life, mainly because it was so portable – but used the medium like no other. She developed a strong, illustrative style using flat bright colours and employing her distinctive black line around everything. Her many sketchbooks reveal her keen eye, studious approach and excellent skills in draughtsmanship which enabled her to capture the detail of architecture, landscape and human expression with the minimum of brushstrokes and with highly deceptive ease. She always painted from life after being told by her father that, “you must never do anything from a flat copy – never, never, never.” And, she loved to sit outside and capture scenes of everyday life and human experience – whether she was painting in a Devon village or a Venetian cafe; on a Tyrolian mountainside or a Barbados beach. Her paintings present extemely well observed compostions with witty characterisation. 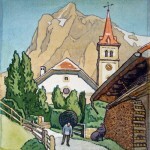 Most of her distinctive watercolours were painted between 1935 and 1975. In her eighties – and in the 1980’s – White was given her first solo show ‘Hallo Sunshine’ at the Salthouse Gallery in St Ives. Her paintings sold – and they sold well. The show gained critical acclaim and led to another. Gallery owner Bob Deveraux did a great deal to draw attention to the quality of her work. Interviewed in 2001, he said: “I am confident that if Clare White had chosen to go into book illustration she would have been a household name many years ago.” Indeed, her later works are reminiscent of the iconic railway posters of the 1930s and 40s and her drawings would have been ideally featured in classic children’s books of the era. After her death in a nursing home in Lelant, near St Ives in 1997, her work was exhibited by Paul Vibert at ‘The Gallery’ in Street an Pol, St Ives, in a show titled “Old Ladies do Watercolours.” In 2002, Andy Pollard curated exhibitions which broke sales records at Rotherham Art Centre and Harrogate Walker Galleries. And, in 2003 she went ‘home’ with a major retrospective at the St Ives Arts Club. In 2009 Clare White’s work featured in a show of “investment quality paintings of urban and rural scenes by leading 20th century artists” at Derwent-Wye Fine Art in Derbyshire. And, a solo exhibition of her work was held in spring at the Thoresby Gallery in North Nottinghamshire. “Clare said: Look at all the famous work you have produced, while I have only done little things. Barbara replied: Yes but you have lived.